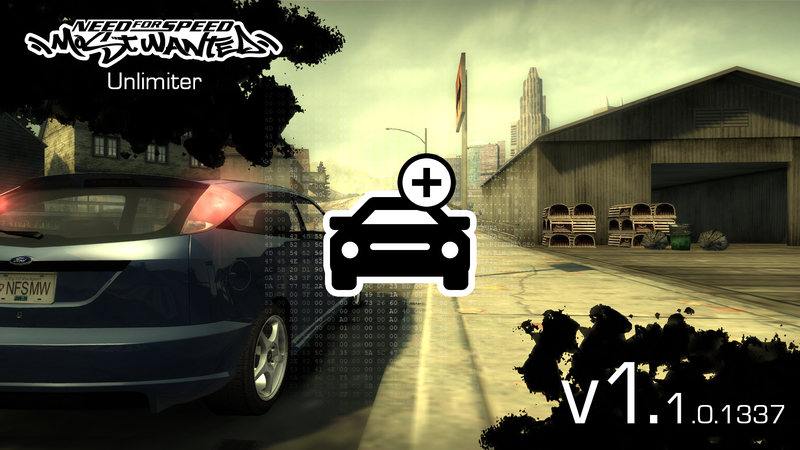 NFSMW Unlimiter is a script mod which fixes some issues and makes some improvements for added cars. + Fixes visibility and crash issues for added cars. + Fixes disappearing wheels issue. + Fixes secondary logo issue for cars without manufacturer logo. + Allows users to use more than 10 cars in traffic patterns. + Can expand memory pools. It makes all the changes required in your GlobalB.bun/lzc. You just need to add VLT node and compile a car with custom xname.
! Before installation, make sure that you're using v1.3 speed.exe (5,75 MB (6.029.312 bytes)). If not, just search "NFS Most Wanted NO DVD Crack RELOADED" on Google, Bing or any search engine you like. 2) Extract "scripts" folder and "dinput8.dll" into your NFSMW Installation Folder. IMPORTANT: Delete any instances of Mod Loader (d3d9.dll, modloader.ini, etc.). This script isn't compatible with Mod Loader. Having both ModLoader and Unlimiter WILL cause issues. + Added an option to modify the car count limit for traffic patterns. * Reworked car count limit methods to support more than 128 cars. + Added 3 new manufacturer names to the list in the ini file. + Added config file. (NFSMWUnlimiterSettings.ini).
! IMPORTANT: If you cannot use the config file properly; move your game installation to somewhere else or run your game as administrator. + Added an option to Expand Memory Pools (for non-ExOpts users). + Added an option to fix disappearing wheels issue for open-wheel cars. (for non-ExOpts users). + Secondary logo can now be force-shown even if the car doesn't have a manufacturer logo. - 379Felipe and Speedyheart for letting me know about the car limit in executable. - Hex-Rays for IDA PRO. - MWInside for Texture Compiler. - EA Black Box for accidentally adding symbols into NFSMW PS2 Alpha 124 build. I'm having trouble adding cars with MWinside's ReCompiler, is there any other information about this you can point me to or would you be willing lend me a hand in this? @FarrelPrayoga157: Make sure that you have the files for both of the cars in your Recompiler folder. Also, car IDs may change if you add a car name alphabetically earlier from the ones you added earlier. It's recommended to remove all your tuned cars (or better, start a new save game) after each car adding operation. How do i fix that? Did i require another file or script in order to work?